Hard-hitting Indian cricketer Robin Uthappa is the overwhelming choice for ‘Coorg Person of the Year’ in a poll conducted by www.coorgtourisminfo.com, the first news and tourism portal of Kodagu (Coorg). The other nominations included Indian Ambassador to Armenia and Georgia Baddira Reena Poovaiah, a career Indian Foreign Service officer, and Pandanda M.Kuttappa, who conceptualized the Kodava ‘family hockey’ festival. Kodagu , considered one of the nurseries of Indian hockey, has contributed several outstanding players to the national team. In the recent years, cricket has slowly begun taking over the place of hockey in Kodagu. Robin is the first from Kodagu to make it to the Indian cricket team and 2007 has been a special year for him. 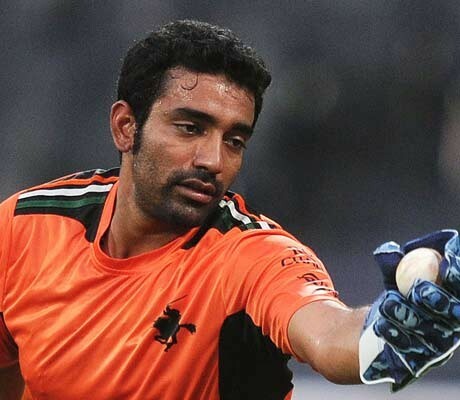 Born on November 11, 1985, son of Aiyudda Venu Uthappa and Roselyn, Robin too would have ended up as a hockey player. However, his father Venu, a well-known hockey player himself and an international hockey umpire, noticed that Robin had a natural flair for cricket and encouraged him to concentrate on the game. Veteran cricketer P.K. Belliappa, who played for Tamil Nadu in Ranji matches, was perhaps the first from Kodagu to play big time cricket. After Robin, K.P. Appanna, Karnataka Ranji player, who has been named in the Indian under-19 team, is the next big hope from Kodagu to play for India. Last year, Boverianda Nanjamma Chinnappa, researcher and writer, was chosen as the ‘Coorg Person of the Year’. Coorgtourisminfo.com has been promoted by Bangalore-based journalist P.T. Bopanna.